"Contemporary" redirects here. For other uses, see Contemporary (disambiguation). "Current history" redirects here. For the academic journal, see Current History. "Living memory" redirects here. For other uses, see Living memory (disambiguation). Not to be confused with Late modern period or Late modernity. Contemporary history, in English-language historiography, is a subset of modern history which describes the historical period from approximately 1945 to the present. The term "contemporary history" has been in use at least since the early 19th century. Contemporary history is politically dominated by the Cold War (1945–91) between the United States and Soviet Union whose effects were felt across the world. The confrontation, which was mainly fought through proxy wars and through intervention in the internal politics of smaller nations, ultimately ended with the dissolution of the Soviet Union and Warsaw Pact in 1991, following the Revolutions of 1989. The latter stages and aftermath of the Cold War enabled the democratisation of much of Europe, Africa, and Latin America. In the Middle East, the period after 1945 was dominated by conflict involving the new state of Israel and the rise of petroleum politics, as well as the growth of Islamism after the 1980s. The first supranational organisations of government, such as the United Nations and European Union, emerged during the period after 1945, while the European colonial empires in Africa and Asia collapsed, gone by 1975. Countercultures rose and the sexual revolution transformed social relations in western countries between the 1960s and 1980s, epitomised by the Protests of 1968. Living standards rose sharply across the developed world because of the post-war economic boom, whereby such major economies as Japan and West Germany emerged. The culture of the United States, especially consumerism, spread widely. By the 1960s, many western countries had begun deindustrializing; in their place, globalization led to the emergence of new industrial centres, such as Japan, Taiwan and later China, which exported consumer goods to developed countries. Science began transforming after 1945: spaceflight, nuclear technology, laser and semiconductor technology were developed alongside molecular biology and genetics, particle physics, and the Standard Model of quantum field theory. Meanwhile, the first computers were created, followed by the Internet, beginning the Information Age. In the first half of the 20th century, the world saw a series of great conflagrations, World War I and World War II. Near the end of the first world war, there were a series of Russian Revolutions and a Russian Civil War. In between the world wars, the 1920s saw a great rise in prosperity where much of the world saw progress and new technology, but this was soon ended by the Great Depression. During this time, the League of Nations was formed to deal with global issues, but failed to garner enough support by the leading powers, and a series of crises once again led the world into another epoch of violence. Notable events during the modern period of universal history include two world wars and the Cold War, characterized by the rivalry between the United States and the Soviet Union. The Cold War began in 1947 and lasted until 1991. The Space Age was concurrent with this time, encompassing the activities related to the Space Race, space exploration, space technology, and the cultural developments influenced by these events. Pax Americana is an appellation applied to the historical concept of relative liberal peace in the Western world, resulting from the preponderance of power enjoyed by the United States of America after the end of World War II in 1945. The post-1945 world experienced the establishment of many new states. Throughout the post-1945 period, the Cold War was expressed through military coalitions, espionage, weapons development, invasions, propaganda, and competitive technological development. The Soviet Union created the Eastern Bloc of countries that it occupied, annexing some as Soviet Socialist Republics and maintaining others as satellite states that would later form the Warsaw Pact. The United States and various Western European countries began a containment policy for communism and forged alliances to this end, including NATO. The conflict included defense spending, a conventional and nuclear arms race, and various proxy wars; the two superpowers never fought one another directly. The post-1989 world saw the end of the totalitarian regimes of the Cold War and the ending of client state status for many states. The Cold war was effectively ended by the Revolutions of 1989, and the Malta Summit on December 3, 1989. The Soviet Union was dissolved on December 26, 1991. Various "post-Cold War regimes" established were democratic republics, though some were authoritarian/oligarchic republics. In Latin America, military regimes supported by the CIA, such as that facilitated by the United States intervention in Chile, also fell (see also Covert United States foreign regime change actions). The Pinochet regime collapsed in 1990. In Southeast Asia, the right-wing developmental dictatorships were overthrown by popular uprisings. A Visualization of the various routes through a portion of the Internet. Partial map of the Internet based in 2005. 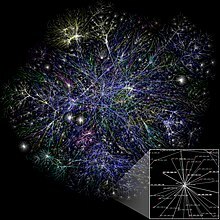 The Information Age or Information Era, also commonly known as the Age of the Computer, is an idea that the current age will be characterized by the ability of individuals to transfer information freely, and to have instant access to knowledge that would have been difficult or impossible to find previously. The idea is heavily linked to the concept of a Digital Age or Digital Revolution, and carries the ramifications of a shift from traditional industry that the Industrial Revolution brought through industrialization, to an economy based around the manipulation of information. The period is generally said to have begun in the latter half of the 20th century, though the particular date varies. The term began its use around the late 1980s and early 1990s, and has been used up to the present with the availability of the Internet. During the late 1990s, both Internet directories and search engines were popular—Yahoo! and Altavista (both founded 1995) were the respective industry leaders. By late 2001, the directory model had begun to give way to search engines, tracking the rise of Google (founded 1998), which had developed new approaches to relevancy ranking. Directory features, while still commonly available, became after-thoughts to search engines. Database size, which had been a significant marketing feature through the early 2000s (decade), was similarly displaced by emphasis on relevancy ranking, the methods by which search engines attempt to sort the best results first. "Web 2.0" is characterized as facilitating communication, information sharing, interoperability, User-centered design and collaboration on the World Wide Web. It has led to the development and evolution of web-based communities, hosted services, and web applications. Examples include social-networking sites, video-sharing sites, wikis, blogs, mashups and folksonomies. Social networking emerged in the early 21st century as a popular social communication, largely replacing much of the function of email, message boards and instant messaging services. Twitter, Facebook, and YouTube are all major examples of social websites that gained widespread popularity. The information distribution continued into the early 21st century with mobile interaction and Internet access growing massively in the early 21st century. By the 2010s, a majority of people in the developed world had Internet access and a majority of people worldwide had a mobile phone. Marking the rise of mobile computing, worldwide sales of personal computers fall 14% during the first quarter of 2013. The Semantic Web (dubbed, "Web 3.0") begins the inclusion of semantic content in web pages, converting the current web dominated by unstructured and semi-structured documents into a "web of data". With the rise of information technology, computer security, and information security in general, is a concern for computers and networks. Concerns include information and services which are protected from unintended or unauthorized access, change or destruction. This has also raised questions of Internet privacy and personal privacy globally. Major political developments in the 2000s (decade) for the United States and the Middle East revolved around recent modern terrorism, the War on Terrorism, the Afghanistan War, and the Iraq War. The World Trade Center on fire and the Statue of Liberty. 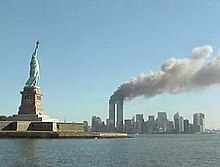 The September 11 attacks - which were described as a "watershed moment" of contemporary history - were a series of coordinated suicide attacks by Al-Qaeda upon the United States on 11 September 2001. On that morning, 19 Al-Qaeda terrorists hijacked four commercial passenger jet airliners. The hijackers intentionally crashed two of the airliners into the Twin Towers of the World Trade Center in New York City, killing everyone on board and many others working in the buildings. Both buildings collapsed within two hours, destroying nearby buildings and damaging others. The hijackers crashed a third airliner into the Pentagon in Arlington, Virginia, just outside Washington, D.C. The fourth plane crashed into a field near Shanksville in rural Somerset County, Pennsylvania, after some of its passengers and flight crew attempted to retake control of the plane, which the hijackers had redirected toward Washington, D.C. Major terrorist events after the 11 September 2001 Attacks include the Moscow Theatre Siege, the 2003 Istanbul bombings, the Madrid train bombings, the Beslan school hostage crisis, the 2005 London bombings, the October 2005 New Delhi bombings, and the 2008 Mumbai Hotel Siege. The United States responded to the 11 September 2001 attacks by launching a "Global War on Terrorism", invading Afghanistan to depose the Taliban, who had harbored al-Qaeda terrorists, and enacting the Patriot Act. Many other countries also strengthened their anti-terrorism legislation and expanded law enforcement powers. The 'Global War on Terrorism' is the military, political, legal and ideological conflict against Islamic terrorism and Islamic militants since the 2001 attacks. The War in Afghanistan began in late 2001 and was launched by the United States with the United Kingdom, and NATO-led, UN authorized ISAF in response to the 11 September attacks. The aim of the invasion was to find the whereabouts of Osama bin Laden and other high-ranking al-Qaeda members and put them on trial, to destroy the whole organization of al-Qaeda, and to remove the Taliban regime which supported and gave safe harbor to al-Qaeda. The Bush administration policy and the Bush Doctrine stated forces would not distinguish between terrorist organizations and nations or governments that harbor them. Two military operations in Afghanistan are fighting for control over the country. Operation Enduring Freedom (OEF) is a United States combat operation involving some coalition partners and operating primarily in the eastern and southern parts of the country along the Pakistan border. The second operation is the International Security Assistance Force (ISAF), which was established by the UN Security Council at the end of 2001 to secure Kabul and the surrounding areas. NATO assumed control of ISAF in 2003. The multinational infantry actions, with additional ground forces supplied by the Afghan Northern Alliance, and aerial bombing campaign removed the Taliban from power, but Taliban forces have since regained some strength. The war has been less successful in achieving the goal of restricting al-Qaeda's movement than anticipated. Since 2006, Afghanistan has seen threats to its stability from increased Taliban-led insurgent activity, record-high levels of illegal drug production, and a fragile government with limited control outside of Kabul. At the end of 2008, the war had been unsuccessful in capturing Osama bin Laden and tensions have grown between the United States and Pakistan due to incidents of Taliban fighters crossing the Pakistan border while being pursued by coalition troops. The Second Gulf War began in March 2003 with the invasion of Iraq by a multinational force. The invasion of Iraq led to an occupation and the eventual capture of Saddam Hussein, who was later executed by the Iraqi Government. Violence against coalition forces and among various sectarian groups soon led to asymmetric warfare with the Iraqi insurgency, strife between many Sunni and Shia Iraqi groups, and al-Qaeda operations in Iraq. Evidence of war crimes committed and sanctioned by the United States Department of Justice created controversy globally, and helped dispel the notion of the United States as a liberating force in the War of Terror. Member nations of the Coalition withdrew their forces as public opinion favoring troop withdrawals increased and as Iraqi forces began to take responsibility for security. In late 2008, the U.S. and Iraqi governments approved a Status of Forces Agreement effective through to the end of 2011. The Iraqi Parliament also ratified a Strategic Framework Agreement with the U.S., aimed at ensuring international cooperation in constitutional rights, threat deterrence, education, energy development, and other areas. In 2009, U.S. President Barack Obama announced an 18-month withdrawal window for "combat forces". The Obama administration has renamed the War on Terror as the "Overseas Contingency Operation". Its objectives are to protect US citizens and business interests worldwide, break up terrorist cells in the US, and disrupt al-Qaeda and affiliated groups. The administration has re-focused US involvement in the conflict on the withdrawal of its troops from Iraq, the closing of Guantanamo Bay detention camp, and the surge in Afghanistan. Using information obtained from Khalid Shaikh Mohammed in 2007, the name and whereabouts of one of Bin Laden's couriers, Abu Ahmed al-Kuwaiti, was learned, and the courier eventually led U.S. intelligence to the location of Osama bin Laden, which was located in a large compound in Abbottabad, Pakistan, a suburban area 35 miles from Islamabad. On 1 May 2011, he was killed and the papers and computer drives and disks from the compound were seized. In 2011 Europe, the former Bosnian Serb Army commander Ratko Mladić, wanted for genocide, war crimes and crimes against humanity, is arrested on 26 May in Serbia by the Military Security Agency. In 2011, the United States formally declared an end to the Iraq War. The Arab Spring began in earnest in 2010 with anti-government protests in the Muslim world, but quickly escalated to full-scale military conflicts in countries like Syria, Libya, and Yemen and also gave the opportunity for the emergence of various militant groups including the Islamic State (IS). The IS was able to take advantage of social media platforms including Twitter to recruit foreign fighters from around the world and seized significant portions of territory in Iraq, Syria, Afghanistan, and the Sinai Peninsula of Egypt from 2013 and ongoing. On the other hand, some violent militant organizations were able to negotiate peace with governments including the Moro Islamic Liberation Front in the Philippines in 2014. The presence of IS and the stalemate in the Syrian Civil War created a migration of refugees to Europe and also galvanized and encouraged high-profile terrorism attacks and armed conflicts around the world, such as the November 2015 Paris attacks and the Battle of Marawi in the Philippines in 2017. In 2014, the United States decided to intervene against the Islamic State in Iraq, with most IS fighters being driven out by the end of 2018. Russia and Iran also jointly launched a campaign against IS in Syria, in support of Syrian President Bashar al-Assad, coming at odds with United States aims. The Government of Russia, largely led by President Vladimir Putin, have opposed the enlargement of NATO as encroaching on Russian autonomy. In the last fifteen years, they have intervened in a variety of military conflicts in its neighboring countries including Georgia and Ukraine (leading to the annexation of Crimea and an ongoing war in Eastern Ukraine). In the beginning of the 2000s (decade), there was a global rise in prices in commodities and housing, marking an end to the commodities recession of 1980–2000. The US mortgage-backed securities, which had risks that were hard to assess, were marketed around the world and a broad based credit boom fed a global speculative bubble in real estate and equities. The financial situation was also affected by a sharp increase in oil and food prices. The collapse of the American housing bubble caused the values of securities tied to real estate pricing to plummet thereafter, damaging financial institutions. The late-2000s recession, a severe economic recession which began in the United States in 2007, was sparked by the outbreak of a modern financial crisis. The modern financial crisis was linked to earlier lending practices by financial institutions and the trend of securitization of American real estate mortgages. The emergence of Sub-prime loan losses exposed other risky loans and over-inflated asset prices. The Great Recession spread to much of the industrialized world, and has caused a pronounced deceleration of economic activity. The global recession occurred in an economic environment characterized by various imbalances. This global recession has resulted in a sharp drop in international trade, rising unemployment and slumping commodity prices. The recession renewed interest in Keynesian economic ideas on how to combat recessionary conditions. However, various industrial countries continued to undertake austerity policies to cut deficits, reduced spending, as opposed to following Keynesian theories. From late 2009 European sovereign-debt crisis, fears of a sovereign debt crisis developed among investors concerning rising government debt levels across the globe together with a wave of downgrading of government debt of certain European states. Concerns intensified early 2010 and thereafter making it difficult or impossible for sovereigns to re-finance their debts. On 9 May 2010, Europe's Finance Ministers approved a rescue package worth €750 billion aimed at ensuring financial stability across Europe. The European Financial Stability Facility (EFSF) was a special purpose vehicle financed by members of the eurozone to combat the European sovereign debt crisis. In October 2011 eurozone leaders agreed on another package of measures designed to prevent the collapse of member economies. The three most affected countries, Greece, Ireland and Portugal, collectively account for six percent of eurozone's gross domestic product (GDP). In 2012, Eurozone finance ministers reached an agreement on a second €130-billion Greek bailout. In 2013, the European Union agreed to a €10 billion economic bailout for Cyprus. The world is in the third millennium. The 21st century is the century of the Christian Era or Common Era in accordance with the Gregorian calendar. It began on 1 January 2001 and will end 31 December 2100. The 2010s, or The Tens, decade runs from 1 January 2010, to 31 December 2019. The third millennium is the third period of one thousand years. As this millennium is in progress, only its first decade, the 2000s (decade), can be the subject of the conventional historian's attention. The remaining part of the 21st century and longer-term trends are researched by futures studies, an approach that uses various models and several methods (such as "forecasting" and "backcasting"). Ever since the invention of history, people have searched for "lessons" that might be drawn from its study, on the principle that to understand the past is potentially to control the future. A famous quote by George Santayana has it that "Those who cannot remember the past are condemned to repeat it." Arnold J. Toynbee, in his monumental Study of History, sought regularities in the rise and fall of civilizations. In a more popular vein, Will and Ariel Durant devoted a 1968 book, The Lessons of History, to a discussion of "events and comments that might illuminate present affairs, future possibilities... and the conduct of states." Discussions of history's lessons often tend to an excessive focus on historic detail or, conversely, on sweeping historiographic generalizations. Future Studies takes as one of its important attributes (epistemological starting points) the ongoing effort to analyze alternative futures. This effort includes collecting quantitative and qualitative data about the possibility, probability, and desirability of change. The plurality of the term "futures" in futurology denotes the rich variety of alternative futures, including the subset of preferable futures (normative futures), that can be studied. Practitioners of the discipline previously concentrated on extrapolating present technological, economic or social trends, or on attempting to predict future trends, but more recently they have started to examine social systems and uncertainties and to build scenarios, question the worldviews behind such scenarios via the causal layered analysis method (and others) create preferred visions of the future, and use backcasting to derive alternative implementation strategies. Apart from extrapolation and scenarios, many dozens of methods and techniques are used in futures research. At the end of the 20th century, the world was at a major crossroads. Throughout the century, more technological advances had been made than in all of preceding history. Computers, the Internet, and other modern technology radically altered daily lives. Increased globalization, specifically Americanization, had occurred. While not necessarily a threat, it has sparked anti-Western and anti-American sentiment in parts of the developing world, especially the Middle East. The English language has become a leading global language, with people who did not speak it becoming increasingly disadvantaged. A trend connecting economic and political events in North America, Asia, and the Middle East is the rapidly increasing demand for fossil fuels, which, along with fewer new petroleum finds, greater extraction costs (see peak oil), and political turmoil, saw the price of gas and oil soar ~500% between 2000 and 2005. In some places, especially in Europe, gas could be $5 a gallon, depending on the currency. Less influential, but omnipresent, is the debate on Turkey's participation in the European Union. New urbanism and urban revival continue to be forces in urban planning in the United States. However, evidence shows that growth of American suburbs still outpaces urban growth. In the contemporary era, several issues are faced in the world. First of all, wealth is concentrated among the G8 and Western industrialized nations, along with several Asian nations and OPEC countries. The richest 1% of adults alone owned 40% of global assets in the year 2000 and that the richest 10% of adults accounted for 85% of the world total. The bottom half of the world adult population owned barely 1% of global wealth. Another study found that the richest 2% own more than half of global household assets. Despite this, the distribution has been changing quite rapidly in the direction of greater concentration of wealth. Nevertheless, powerful nations with large economies and wealthy individuals can improve the rapidly evolving economies of the Third World. However, developing countries face many challenges, including the scale of the task to be surmounted, rapidly growing populations, and the need to protect the environment, and the cost that goes along with facing such challenges. Climate change and global warming reflects the notion of the modern climate. The changes of climate over the past century, have been attributed to various factors which have resulted in a global warming. This warming is the increase in the average temperature of the Earth's near-surface air and oceans since the mid-20th century and its projected continuation. Some effects on both the natural environment and human life are, at least in part, already being attributed to global warming. A 2001 report by the IPCC suggests that glacier retreat, ice shelf disruption such as that of the Larsen Ice Shelf, sea level rise, changes in rainfall patterns, and increased intensity and frequency of extreme weather events are attributable in part to global warming. Other expected effects include water scarcity in some regions and increased precipitation in others, changes in mountain snowpack, and adverse health effects from warmer temperatures. It usually is impossible to connect specific weather events to human impact on the world. Instead, such impact is expected to cause changes in the overall distribution and intensity of weather events, such as changes to the frequency and intensity of heavy precipitation. Broader effects are expected to include glacial retreat, Arctic shrinkage, and worldwide sea level rise. Other effects may include changes in crop yields, addition of new trade routes, species extinctions, and changes in the range of disease vectors. Until 2009, the Arctic Northwest Passage pack ice prevented regular marine shipping throughout most of the year in this area, but climate change has reduced the pack ice, and this Arctic shrinkage made the waterways more navigable. The first fully functional Space Shuttle orbiter was Columbia (designated OV-102), launched into Earth orbit in April 1981. In 1996, Shuttle mission STS-75 conducted research in space with the electrodynamic tether generator and other tether configurations. In 135 missions, the program suffered with two shuttles destroyed. The successful landing at Kennedy Space Center after completing STS-135 concluded the shuttle program. The Commercial Orbital Transportation Services (COTS) program began in 2006. The retirement of NASA's Space Shuttle fleet took place from March to July 2011. There are various spaceports, including spaceports of human spaceflight and other launch systems (space logistics). Private spaceflight is flight beyond the Kármán line that is conducted and paid for by an entity other than a government agency. Commercialization of space is the use of equipment sent into or through outer space to provide goods or services of commercial value, either by a corporation or state. Space trade plans and predictions began in the 1960s. Spacecraft propulsion is any method used to accelerate spacecraft and artificial satellites. NASA announced in 2011 that its Mars Reconnaissance Orbiter captured photographic evidence of possible liquid water on Mars during warm seasons. On 6 August 2012, the Mars Science Laboratory Curiosity, the most elaborate Martian exploration vehicle to date, landed on Mars. After the WMAP observations of the cosmic microwave background, information was released in 2011 of the work done by the Planck Surveyor, estimating the age of the Universe to 13.8 billion years old (a 100 million years older than previously thought). Another technological advancement came in 2012 with European physicists statistically demonstrating the existence of the Higgs boson. ^ Brivati, Brian (1996). "Introduction". In Brivati, Brian; Buxton, Julia; Seldon, Anthony. The contemporary history handbook (1st ed.). Manchester: Manchester University Press. p. xvi. ISBN 9780719048364. ^ Steven Levitsky, Lucan A. Way. Competitive Authoritarianism: Hybrid Regimes After the Cold War. 2010. Pg 3. ^ With the People Power Revolution, Corazon Aquino's assumption into power marked the restoration of democracy in the country. ^ "Core Characteristics of Web 2.0 Services". ^ "Total mobile subscribers top 1.8 billion". MobileTracker Cell Phone News and Reviews. 18 May 2005. Archived from the original on 19 January 2008. Retrieved 31 December 2008. ^ "Security Council Condemns, 'In Strongest Terms', Terrorist Attacks on the United States". United Nations. 12 September 2001. Retrieved 11 September 2006. The Security Council today, following what it called yesterday's "horrifying terrorist attacks" in New York, Washington, D.C., and Pennsylvania, unequivocally condemned those acts, and expressed its deepest sympathy and condolences to the victims and their families and to the people and Government of the United States. ^ "Bin Laden claims responsibility for 9/11". CBC News. 29 October 2004. Retrieved 11 January 2009. Al-Qaeda leader Osama bin Laden appeared in a new message aired on an Arabic TV station Friday night, for the first time claiming direct responsibility for the 2001 attacks against the United States. ^ Gall, Carlotta (3 September 2006). "Opium Harvest at Record Level in Afghanistan". The New York Times. Retrieved 30 April 2010. ^ "Afghanistan opium at record high". BBC News. 27 August 2007. Retrieved 2 January 2010. ^ "Afghanistan could return to being a 'failed State,' warns Security Council mission chief". ^ "US Names Coalition of the Willing". BBC News. 18 March 2003. Retrieved 3 November 2007. ^ "CBS on civil war". CBS News. 26 September 2006. 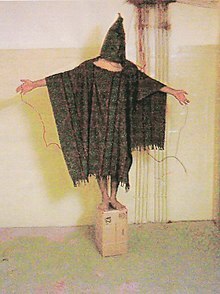 ^ "The Torture Memos, 10 Years Later". The Atlantic. 6 Feb 2012. Retrieved 1 April 2019. ^ Britain's Brown visits officials, troops in Iraq. International Herald Tribune, 2 October 2007. ^ "Presidential Address to the Nation" (Press release). The White House. 7 October 2001. ^ "Counterterrorism and Terrorism". Federal Bureau of Investigation. Archived from the original on 5 October 2015. Retrieved 14 April 2008. ^ Mazzetti, Mark; Helene Cooper; Peter Baker (3 May 2011). "Clues Gradually Led to the Location of Osama bin Laden". The New York Times. Retrieved 4 May 2011. ^ "US flag ceremony ends Iraq operation". BBC. Retrieved 15 December 2011. ^ Easley, Jonathan (15 December 2011). "Panetta marks Iraq war's end in Baghdad". DEFCON Hill – The HILL'S Defense Blog. Retrieved 15 December 2011. ^ "US lowers flag to end Iraq war". The Associated Press. 15 December 2011. Retrieved 15 December 2011. ^ "U.S. formally ends Iraq war with little fanfare". The Associated Press. 15 December 2011. Retrieved 15 December 2011. ^ This American Life. "NPR-The Giant Pool of Money-April 2009". Pri.org. Archived from the original on 15 April 2010. Retrieved 1 May 2010. ^ In December 2008, the National Bureau of Economic Research (NBER) declared that the United States had been in recession since December 2007. See Isidore, Chris (1 December 2008). "It's official: Recession since December '07". CNN Money. Retrieved 10 April 2009. for more information. ^ Hulbert, Mark (15 July 2010). "It's Dippy to Fret About a Double-Dip Recession". ^ Mishkin, Fredric S. (15 May 2008). How Should We Respond to Asset Price Bubbles? (Speech). Retrieved 18 April 2009. ^ See Great Recession for the origins and other uses of this label. ^ Wessel, David (8 April 2010). "Did 'Great Recession' Live Up to the Name?". The Wall Street Journal. ^ One of the major developments was when Standard & Poor's downgraded Greece's sovereign credit rating to junk four days after the activation of a €45-billion EU–IMF bailout, triggering the decline of stock markets worldwide and of the Euro's value, and furthered the European sovereign debt crisis. ^ Robert V. Daniels, "History", Encyclopedia Americana, 1986 ed., vol. 14, p. 227. ^ Arnold J. Toynbee, A Study of History, vols. I–XII, Oxford University Press, 1934–61. ^ Will and Ariel Durant, The Lessons of History, New York, Simon and Schuster, 1968, prelude. ^ Berkeley Eddins and Georg G. Iggers, "History", Encyclopedia Americana, 1986 ed., vol. 14, pp. 243–44. ^ a b Extensive statistics, many indicating the growing world disparity, are included in the available report, press releases, Excel tables and Powerpoint slides. See The World Distribution of Household Wealth. James B. Davies, Susanna Sandstrom, Anthony Shorrocks, and Edward N. Wolff. 5 December 2006. ^ "Climate Change 2001: Impacts, Adaptation and Vulnerability. Contribution of Working Group II to the Third Assessment Report of the Intergovernmental Panel on Climate Change". IPCC. 16 February 2001. Retrieved 14 March 2007. ^ McMichael AJ, Woodruff RE, Hales S (2006). "Climate change and human health: present and future risks". Lancet. 367 (9513): 859–69. doi:10.1016/S0140-6736(06)68079-3. PMID 16530580. ^ Macey, Jennifer (19 September 2007). "Global warming opens up Northwest Passage". ABC News. Retrieved 11 December 2007. ^ "Climate Change 2007: Synthesis report" (PDF). Climate Change 2007: Synthesis Report. IPCC. 5 February 2007. Retrieved 3 February 2009. ^ European Space Agency, "News: Satellites Witness Lowest Arctic Ice Coverage in History,” 14 September 2007. ^ "Warming 'opens Northwest Passage'". BBC News. 14 September 2007. ^ Keating, Joshua E. (December 2009). "The Top 10 Stories You Missed in 2009: A few ways the world changed while you weren't looking". Foreign Policy. ^ For more, see Space Shuttle Challenger disaster and Space Shuttle Columbia disaster. ^ This is above the nominal edge of space at 100 km (62 mi) Earth's altitude. See also: Turbopause; Low, Medium, and High Earth orbit. ^ There are many different methods, in conventional and unconventional propulsion systems. Each method has drawbacks and advantages, and spacecraft propulsion is an active area of research. However, most spacecraft today are propelled by forcing a gas from the back/rear of the vehicle at very high speed through a supersonic de Laval nozzle. This sort of engine is called a rocket engine. Briggs, Asa, and Peter Burke. A Social History of the Media: From Gutenberg to the Internet (2002) excerpt. Wikimedia Commons has media related to Contemporary history.